Marysville began its annual Healthy Communities Challenge Day in 2009 as part of a larger effort to promote a more active and healthy community. 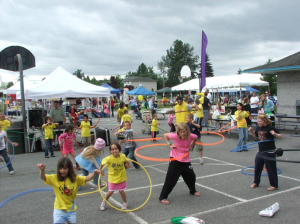 The event introduces attendees to local health and fitness agencies and healthy food vendors, and also provides fitness demonstrations such as Zumba, hula hoop, and jump roping. The free event features giveaways (hula hoops and jump ropes) and free family health screens. A full overview of the Marysville Healthy Communities Challenge Day is available here (pdf).